Got a question for Tom Morello? Tell us and win some D'Addario strings! Got a question for tom morello? TG is interviewing the inimitable Tom Morello next week and we're giving you the chance to ask him your questions. If you've got something you want to ask one of the most innovative guitarists and popular rock songwriters of the last 20 years, just get in touch via the Total Guitar Twitter or Facebook pages or by emailing totalguitar@futurenet.com with the subject line 'Question for Tom Morello' and your name, location and question. 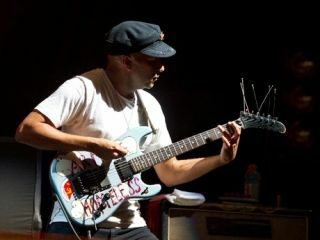 Tom Morello has had an undeniable and massive impact on rock guitar since he guided Rage Against The Machine to greatness in the early '90s. He's one of a select group of game-changing guitarists that have changed players' perceptions of the instrument and this is your chance to pick the brain of a modern guitar great. Maybe you want to about his time in pre-Rage band Lock Up; find out how he achieved a signature sound effect; or where he was when he wrote the riff for 'Killing In The Name'… If you've got a question, let us know! Finally, remember we're a guitar mag, so although we may slip in a few general ones, if you ask a question about Tom's guitar playing or songwriting, you're much more likely to get it answered.